Two motorcycle-borne assailants shot at the Punjab vice-president of Rashtriya Swayamsevak Sangh (RSS), Brigadier Jagdish Gagneja (retd), leaving him seriously injured in the heart of Jalandhar just after 8pm on Saturday. By 11pm, two of the three bullets in his body were removed at the local Patel Hospital, and he was stated to be stable. Brigadier Gagneja, who was accompanied by his wife Sudesh, was shot at when he was returning after shopping at Red Cross Market around 9pm. 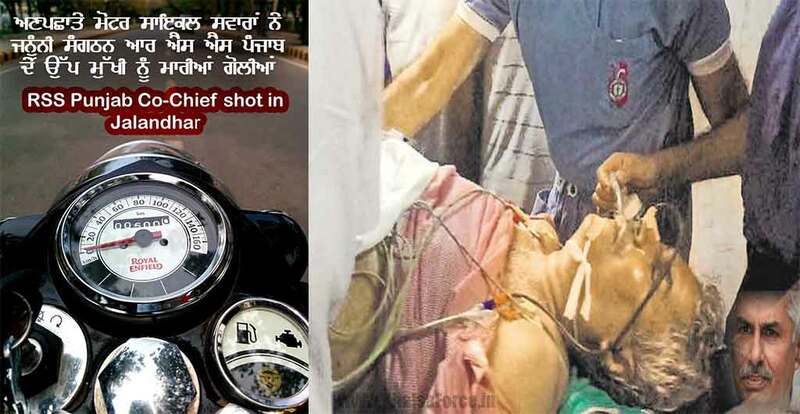 He stopped his Maruti Swift car to answer the call of nature a few metres from his car when the two men with faces covered also brought their motorcycle to a halt and shot at him. They were apparently following the RSS leader. According to eyewitnesses, the attackers fired three bullets that hit Brigadier Gagneja in the chest and stomach. The youth fled after firing in the air, triggering panic in the busy market. They managed to flee despite the crowd and police nakas (checkpoints) in place. Brigadier Gagneja was rushed to the nearby Patel Hospital, where his condition was initially critical. Some RSS and BJP leaders reached the hospital soon after. Additional police force was rushed when former minister and Jalandhar Central MLA Manoranjan Kalia rang up state DGP Suresh Arora. Police commissioner Arpit Shukla said Gagneja was now stable and efforts were on to remove the third bullet.